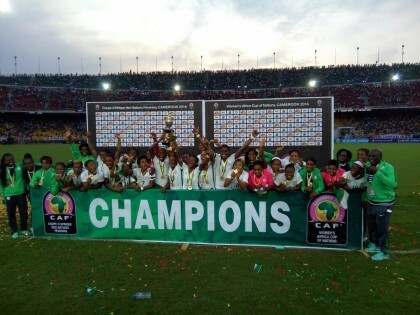 Femi Adesina, Abuja: President Muhammadu Buhari congratulates the Nigeria’s Super Falcons on their victory over the indomitable Lionesses of Cameroon on Saturday at the final game of the women’s Africa Cup of Nations in Yaounde. The President, who described the hard-earned victory over the Indomitable Lionesses as “very sweet and well-deserved,” particularly commends the Nigerian women for their “indomitable spirit, resilience and team work” which spurred them to victory in spite of a vociferous home crowd. President Buhari notes that the Nigerian team achieved “this feat of being African champions for the 8th time,” a development he says has lifted the spirits of sports-loving Nigerians. He enjoins other Nigerian sports men and women to emulate the exemplary attitude of the Super Falcons who placed the interest of the nation above personal interests, while assuring that the Federal Government will not relent in doing its best to promote sports within available resources. The President also salutes the technical competence of the coaching crew, which enabled the Nigerian players to overcome their hard-fighting opponents throughout the competition.